Rana Overseas is the leading manufacturer, Supplier and Exporter of Wooden Money Bank Boxes. These Money Bank Boxes are for Kids and also called PIGGY bank Money boxes. Collect your coins and put them in this cute little coin bank. The coin bank is made of solid wood and is a nice height to add a bit of flair to the room you put this bank in. Has a hole and open the box for coin removal. Our offered range of Wooden Money Box is manufactured in line with global standards. These products are available in various colorful designs and sizes. All these boxes are made as per our clients’ request and used for the purpose of keeping money. These boxes are made using excellent quality material and ensure light weight. Matching up with the ever increasing requirements of the customers, we are engaged in providing Wooden Kids Toy. 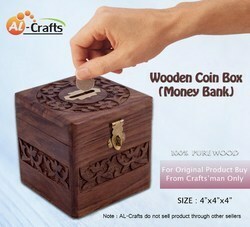 With the assistance of our dedicated team of professionals, we are providing a premium quality range of Wood Coin Box. 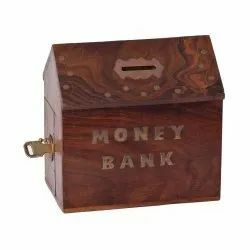 In order to retain remarkable position in this industry, we are providing a wide array of Handmade Wooden Money Box. Being a most reliable organization, we are engaged in offering a wide range of Handcrafted Wooden Money Box. when we have asked for our pocket money. The money bank is just about the perfect size to train your kids to start saving. This Wooden Money Bank Available in Different sizes & Design.